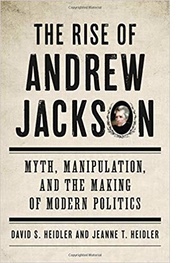 David S. Heidler and Jeanne T. Heidler are the authors of The Rise of Andrew Jackson: Myth, Manipulation, and the Making of Modern Politics (New York: Basic Books, 2018). That question over the last three years has become nearly as fundamental about politics as Hamlet’s existential one was about life. But one might also notice it is almost always rhetorical, as if the people posing it have already concluded that Trump and Jackson are very much alike indeed. Perhaps the process stems from an effort to understand the Trump phenomenon by applying a historical marker that can make it more charted ground. But if that is the reason for the question, it is essential to examine the supposed equivalence between Donald Trump and Andrew Jackson beyond the highlights of historical markers. Historical context provides a better answer but to a different question. 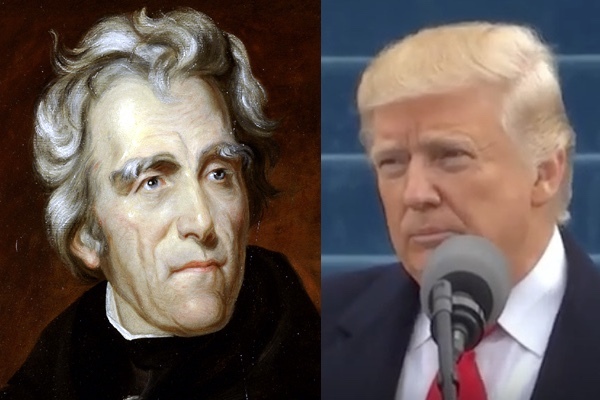 To be sure, Jackson and Trump have apparent similarities. Both campaigned as political outsiders. Jackson was portrayed as just the man to clean out Washington’s “Augean Stables” of self-interest and corruption, and Donald Trump pledged to “Drain the Swamp,” an apt description for a place that promotes special interests while protecting aloof establishment politicians. With such appealing pledges, both campaigns hailed their candidates as men of action — Jackson in a military setting, Trump in the world of business — whose independent spirit made them uniquely qualified to put the country back on track for its people rather than its politicos. It might surprise that the two centuries separating our time from Andrew Jackson’s have not seen a marked change in perceptions of the nation’s capital as a remote place with a dysfunctional government. A financial panic in 1819, just a few years before Jackson’s bid for the White House, ushered in a severe and prolonged economic depression that led many Americans to suspect that the federal government was worse than unresponsive to their needs. DC was seen as indifferent to the country’s woes by persisting in policies that made things worse. Jackson had a reputation for solving problems with whatever resources were at his disposal. Under his command, a ragtag gaggle of cobbled-together militias had destroyed a professional army of British veterans at New Orleans, and that deed had an enormous appeal when contrasted to those of men easily portrayed as pettifogging politicians. Almost two hundred years later, some 62 million American voters felt the same way about Donald Trump, whose successful business empire indicated a talent for innovation as well as a flair for leadership. But the similarities break down on closer examination. Trump had never held political office before his decision to seek the presidency, but Andrew Jackson had been in public life for most of his adult life, a fact that could have blunted his popular appeal as an outsider. In Tennessee, he started in the powerful Blount-Overton political faction and benefitted from the association by landing in the U.S. House of Representatives and the U.S. Senate in the 1790s. His political ties later led to his career as a judge on the Tennessee Superior Court and his service as a general in the Tennessee militia. His spectacular victory at New Orleans on January 8, 1815, won him an appointment as a major general in command of the U.S. Army’s Southern Division, and when budget retrenchment reduced the army and eliminated his post, he became the governor of Territorial Florida. As Jackson became prominent as a presidential candidate, the Tennessee legislature in 1823 placed him in the U.S. Senate, where he sat during his first run for the presidency in 1824. The portrayal of Jackson as a political outsider was an image crafted to advance his candidacy, and in that, Jackson’s tactic departed from the wholly factual claim lodged by Trump, a true outsider, as the reaction of official Washington to him has repeatedly shown. Comparing the different times in which both men ran for president is more instructive than comparing the men themselves. Even though discontent over the shenanigans in Washington, DC, seems to indicate a common thread spanning the republic’s history, the politics of the 1820s were fundamentally different from those of our time. More important, how those politics began changing in tandem with the advent of Jackson’s candidacy is enlightening. The prevailing attitude for much of the first decades of the American experiment disdained political parties. People saw parties as advancing their interests rather than the country’s and often to the detriment of its citizens. It was believed that when guided by such skewed aims, parties could not help but become nests of corruption, tainting not just the functions of government, but ultimately government itself. The attitude could be judged as another facet of popular displeasure over the flawed policies of ineffectual politicians, but it was more than that. It was the basis for a philosophy embracing civic virtue as essential for sound governance, and everybody, whether in or out of government, adopted it as a sterling ideal worth aspiring to and sustaining, even if imperfectly. It was the reason that everyone called himself a Republican in the years after the War of 1812 while cheerfully engaging in the fiction that political disagreements were grounded only in the methods to be used in the achievement of a mutually envisioned and widely shared set of goals. Those pleasant days of accord, even if merely a pretense, gave the period the moniker “Era of Good Feelings,” but it was too short to be an era and came to be marked by some fairly bad feelings. That happened because parties naturally occur in a political setting for a variety of reasons, one of which is the simple reality that politics is a messy art rather than an exact science. Discipline is necessary to win elections and then to govern effectively after them, and a party is the most effective mechanism for achieving both. During the 1820s men such as Martin Van Buren, and eventually even Andrew Jackson, saw little reason for maintaining the pleasant fictions and openly began to promote political parties as a positive good capable of framing beneficial policies that produce beneficent results. And thus came about the transformation of an earlier and transcendent vision into that of our own time, materially pragmatic but philosophically impoverished. It did not happen overnight but unfolded as a long process that has gradually produced the same discontents that fueled the rise of Andrew Jackson, and now two hundred years later, making possible the rise of Donald Trump. And just as we are reminded that the fault lies not in our stars, but in ourselves, we should also remember that these two men, similar in parts and different in sum, have been the beneficiaries of their times rather than the authors of them. The two have a passing similarity, but the things that long ago lifted one and now another are as timeless as they are recurring, as powerful as they are mysterious, irresistible levers pivoting on the fulcrum of history to move worlds and raise questions. Perhaps the one about the living being incarnations of the dead is the wrong one to ask.